2018 will mark the 10th anniversary of the global financial crisis. Since then, the economy has been on a record long expansion and the stock market has roughly tripled from its bottom. Unfortunately, fear of further pain and a completely new economic environment have kept many people cynical and out of the markets. As markets continue to rally into the New Year, many younger investors have caught a case of FOMO — fear of missing out. 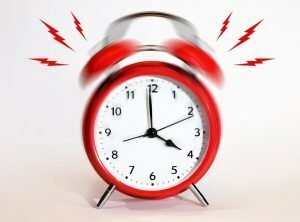 Is it at just the wrong time? Are they making the same mistakes of the past. The answer is probably, they just don’t know it yet. In this year’s letter, I take some time to talk about the continuing “slow growth forever” global economy, President Trump, a new Fed Chief, rising tension in the Middle East and some factors that could play out very badly. 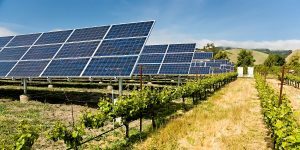 All that though is up against a global economy that is growing, record profits at corporations, near full employment in the United States and a rising standards of living for the tiny Xer generation and the huge Millennial generation. Grab a tall glass of water, this is “must read” material. The Markets Are Topping, But Where’s THE Top? 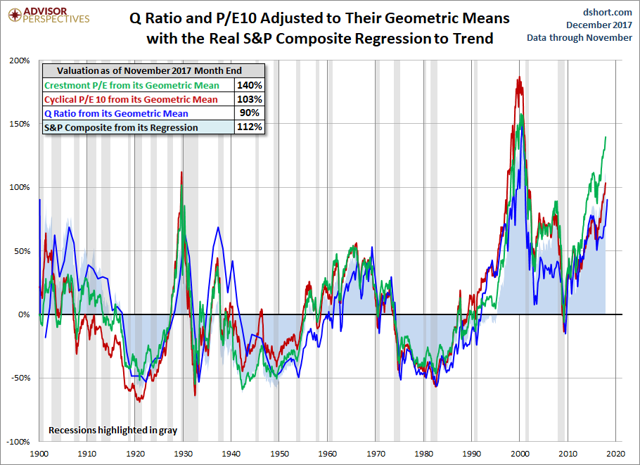 If you read my most recent article The 12 Sells Of Christmas, then you saw the charts I put up showing the similarity between the current bull market and the one from just before the financial crisis. 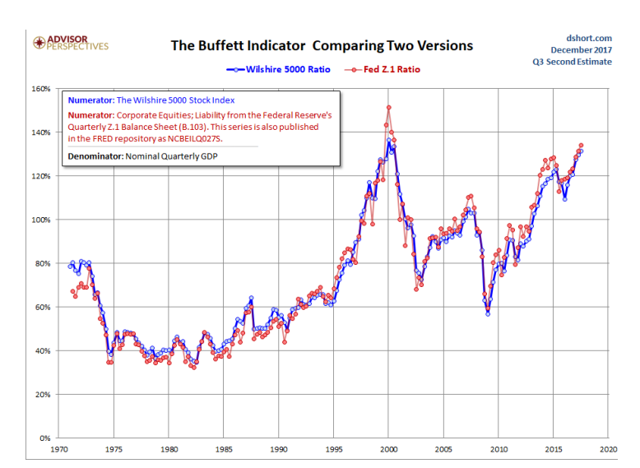 You also saw the CAPE ratio chart. 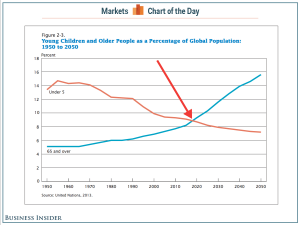 Here are some more scary charts. And, if you don’t find them scary, you don’t scare easy enough, so pay attention and have a little respect and fear of what these charts are implying. Notice, we are approaching the 3rd standard deviation. What does that mean? It means, reversion to, or beyond, the mean is coming. Understand what I mean? Because I mean it. 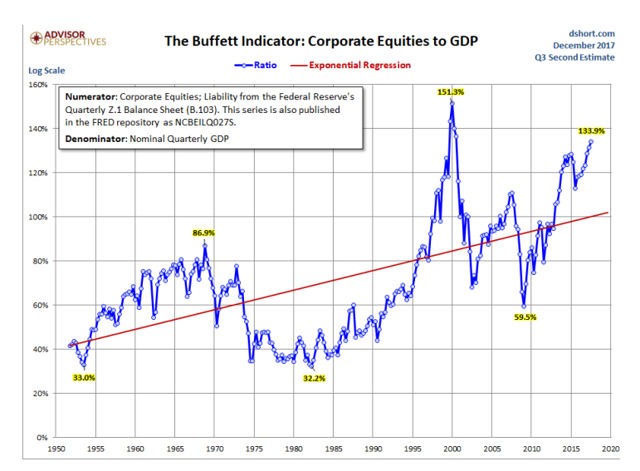 The chart shows that we were undervalued in 2009, but not that much compared to following other crashes. Does this imply more pain ahead? Could be, it could be. For more, read: Validating the S&P Composite Stock Price Index — dshort — Advisor Perspectives. Once again, it’s not hard to see that the stock markets are overvalued. 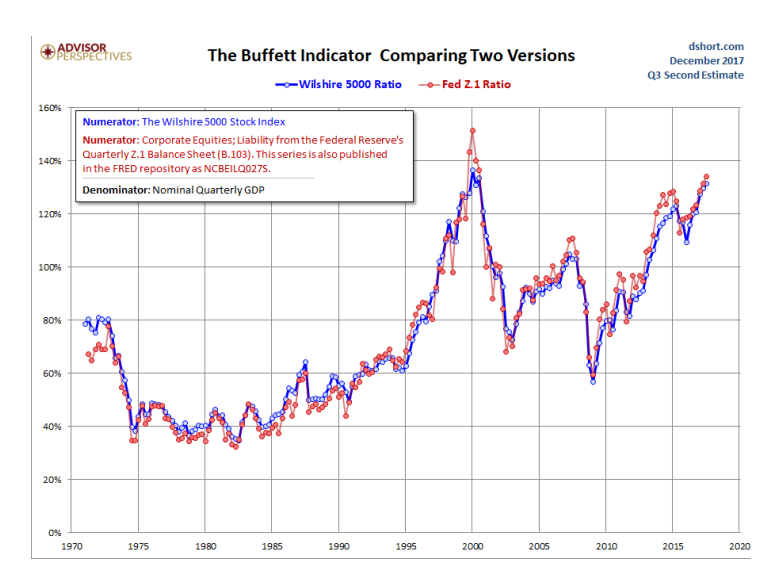 Warren Buffett cites the low interest rates as the reason we are seeing higher valuations. 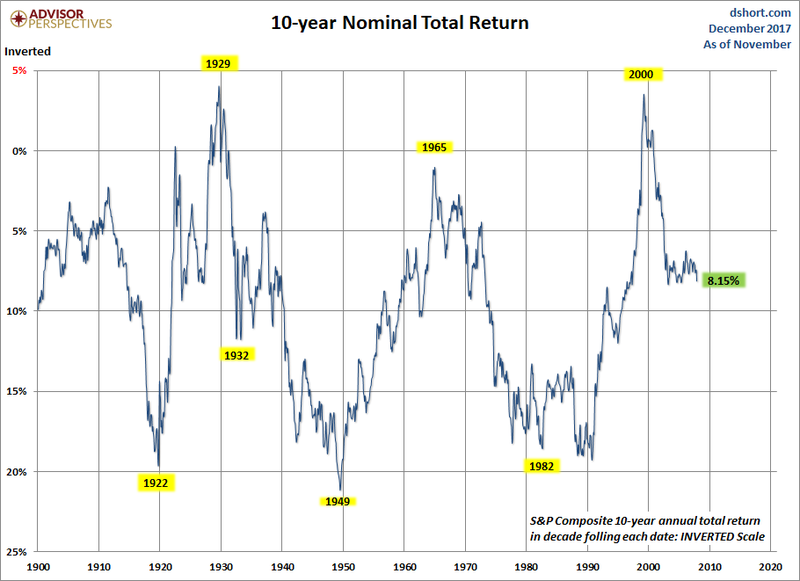 Jeremy Grantham this summer talked about the possibility that we see valuations stay higher for a long time. I don’t argue with either point. 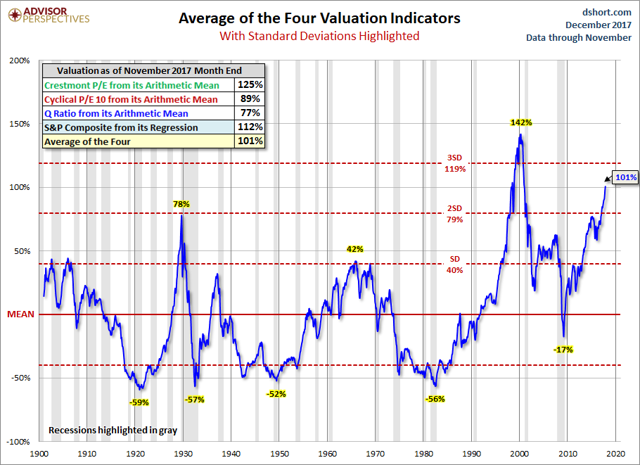 However, the clear overvaluation on stocks adds an element of risk for investors because of the unknown element of whether or not valuations can stay this high. That in and of itself makes investing harder. It is more important than ever to build our own little mini-indexes vs. using the big broad indexes. By having our own 20–30 stock portfolios with a small handful of ETFs, we can use both smart stock selections with asset allocation to protect ourselves and take advantage of investment opportunities. Peter Lynch’s idea that a few big winners can propel a portfolio certainly does play out. That’s why it is important to have a big dose of growth stocks in a portfolio. Our substantial outperformance in 2017 was largely due to just a few stocks and an ETF. I know that it is popular to load up on dividends in portfolios, however, most investors do that wrong. They imagine that high dividends are a sign that a company is doing great. Often, that is a sign that something went wrong and the dividend shot up as the stock price fell. We have seen that play out in hundreds of “safe dividend stocks” over the years. “Dividend growth” investors often forget to focus on that second word: growth. If a company is not growing, but is constantly raising its dividend, at some point they will run into a problem. Revenue and earnings might fall or expenses might rise. As we enter an era of higher interest rates and rising commodity costs, we should be wary of companies that raise their dividends without growth or with use of financial engineering. Overall, 2017 was a very, very good year for most investors. However, investors who glom onto media and financial industry narratives only did about as well as the markets. Why, because whether they intended to or not, they largely indexed to the market. I do not care much for asset allocation strategies that include somehow mirroring indexes — even if inadvertently. To me that completely defeats the point of intelligent asset allocation that I have talked about. When I take equity risk, I am looking for absolute returns. I am not looking to somehow beat the index by a point or two — which is how many dividend growth investors [DGI] seem to think of things now. If I am going to take equity risk, which let’s be very clear here, is to accept that you can wake up 50% down on any given day, then I want anything I own to have enough upside. 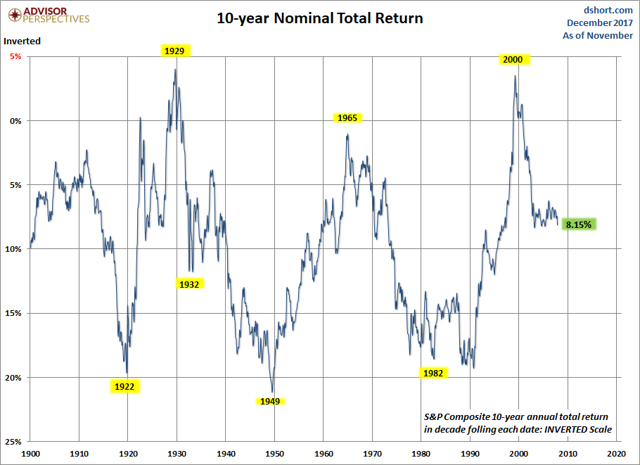 My demand for taking individual stock risk is that I want a very high level of confidence I will double money on a position within 5–7 years (so, 10–15% minimum return) with a good chance the double will actually occur within 2–4 years (18–36%), and that there is a chance the stock triples within 5–7 years (16–23% returns or better). To me, if I can’t shoot for those numbers, what is the point of equities? Macroeconomic analysis, or top down, has largely become a futile form of analysis for many investors who have been foiled by an inability to forecast well. Lackluster returns have led many to abandon even trying to develop investment thesis based on macroeconomic data and analysis. John Curran, formerly a partner and head of commodities at Caxton Associates, and chief investment officer at Tigris Financial Group, discussed the decline of macro investing in an article on Barron’s where he postulated about The Coming Renaissance of Macro Investing. 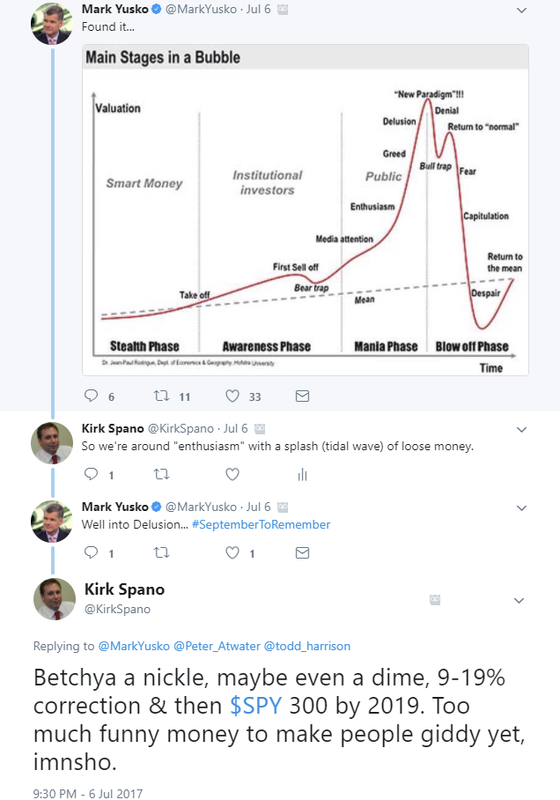 In meetings with fund managers, asset allocators, and analysts, I have found a virtually universal view that macro investing — investing based on global macroeconomic and political, not security — specific trends — is dead, fueled by investor money exiting the space due to poor returns and historically high fees in relation to performance. This is what traders refer to as capitulation. It occurs when most market participants can’t take advantage of a promising opportunity due to losses, lack of dry powder, or a psychological inability to proceed because of recency bias. I believe much of the disappointment with macro analysis for developing investment ideas is that it is used by most in isolation from other methods of analysis. Another clear factor is a lack of talent and unbreachable biases by many of the analysts. I regard this as an extraordinarily opportune moment for those able to shed timeworn, archaic assumptions of market behavior and boldly return to the roots of macro investing. 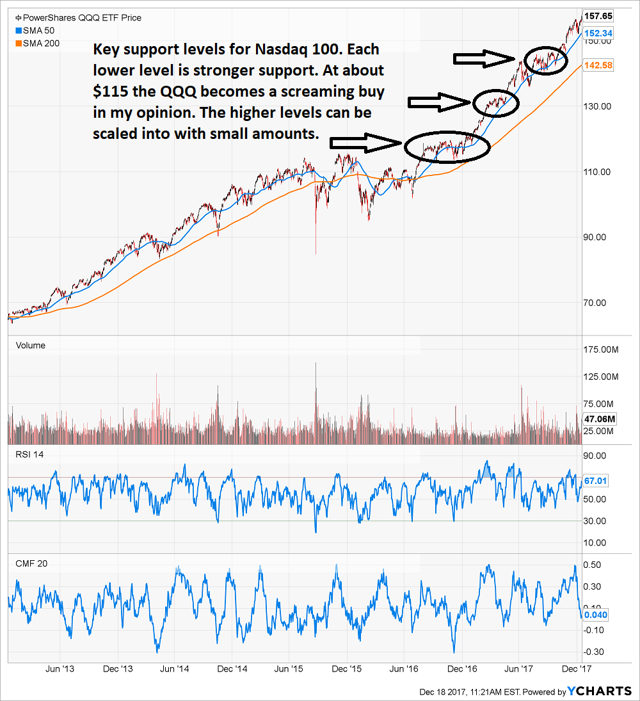 He moved onto a discussion of challenges facing “trend following.” I believe that the trend followers left are about as likely to avoid what I think will be a sudden major correction in equity markets as the indexers who will figure it out around the third or fourth wave down in prices. …THERE IS a running debate as to whether trend-following is a dying strategy. There is plenty of anecdotal evidence that short-term and mean-reversion trading is more in vogue in today’s markets (think quant funds and “prop” shops). Additionally, the popularity of passive investing signals an unwillingness to invest in “idea generation,” or alpha. These developments represent a full capitulation of trend following and macro trading. Now that I have gotten some preliminaries out of the way and before I move onto my sure to be wrong forecast for 2018, let’s take a look at a handful of forecasts for 2017 that were, let’s say, pretty par for the course. Macro forecasts abound near the end and beginning of each year. Here are some of the pronouncements that I found which were often repeated. I’ll include sources to expose the guilty and validate the prescient. - The Fed actually did about exactly what it said it would and long-term interest rates haven’t changed much. - Close on the economy, but no cigar, sticking with large cap tech (XLK) was the play once again for asset allocators, though a few sectors beat the S&P 500Index (SPY) by a hair. - Translation: “we don’t know.” At least that was honest in a long hand sort of way. Their growth estimates were quite a bit light for 2017, so they proved they didn’t know. - Hey, that one is pretty darn good. Yeaaa!!! 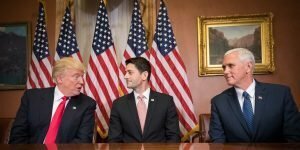 - Of course there has been no fiscal initiative in the United States and a tax cut bill for next year just passed, but growth has continued in America and has expanded more than expected globally despite no U.S. stimulus. - The S&P 500 is of course at about 2,682 right now. Earnings are set to clock in at about $144 according to FactSet. So, RBC takes the prize. Now of course, everybody is revising 2018 forecasts up. This is I presume to make up for being so wrong in 2017. Here’s another link to see how crummy analysts were in 2017. - That’s not the original S&P 500 estimate as the main one was behind a paywall. I’ll go public for 2018 below. I went on with Mark in this exchange, which will lead us to our next section. I’ve had some great talks with market big shots over the years. I’m curious to see if I’m right that we’ll get some early year volatility followed by a rally. We’ll see. 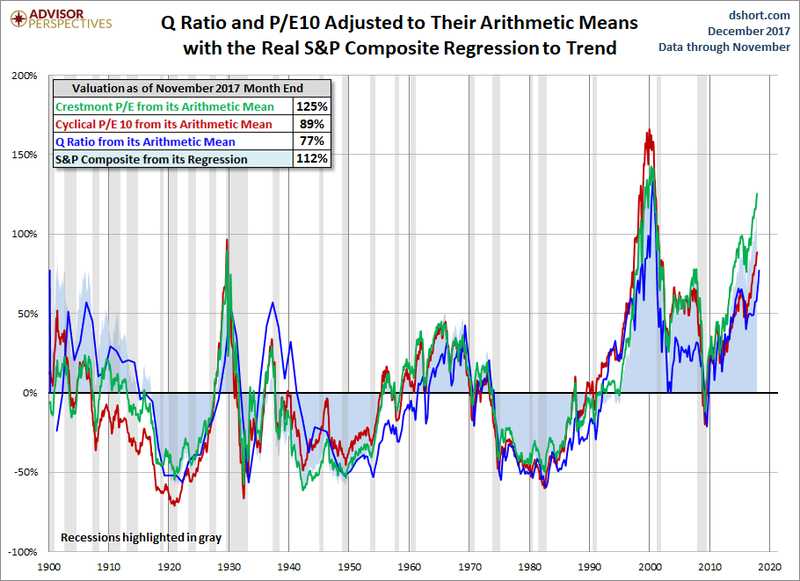 Here you see that the stock market is somewhere between a 2nd and 3rd standard deviation away from mean. What does that mean? It means that we should expect some reversion to the mean. It does not mean that mean reversion has to happen right now though. Know what I mean? It could mean that we see a little correction, which isn’t so mean, and then a move into La La Land past the 3rd standard deviation which will mean look out below, things are going to get mean. While Yusko sees euphoria now, I only see as coming soon. I did mean to have some mean fun with the world mean there by the way. How do I know euphoria isn’t here quite yet? Well, I have the luck of knowing a lot of Millennials due to having been involved with men’s baseball in Milwaukee, I travel, I join their groups and the fact that I still will go to a bar from time to time. Here’s what I know. Most Millennials don’t have the experience to know that things are expensive. One kid, a good kid, but he has no idea, asked me about Bitcoin recently. I told him stay away and gave a list of reasons, including that the Chinese were using it to get money out of China and that Central Banks would clamp down eventually. He bought Bitcoin anyway and then pointed out (it was a humble brag) that he was up like 40% in a few weeks. I told him cash in. I don’t know if he did. But, since then, Bitcoin has taken back what it had given, and then some. In short, the Millennials have not gotten their humbling from the markets yet. There is a great humbling coming. The set-up is going to be a doozy though. The “Gods of Algo” are of course all the money that can be moved quickly via radar waves and fibre optic hot links to the markets that have a .001 second advantage on the rest of us schmucks. I also don’t see much benefit of the tax cuts or a future infrastructure bill in 2018. The benefits will come in 2019 as money is repatriated and some spending actually occurs. The thing is, we know that most of the “found money” will not be invested, it will go to pay down debts and be paid to shareholders. Sure, the half of the population that spends every dime they have will spend it, but who cares, it ain’t that much and is a one off event that will get eaten by inflation down the road. I also don’t think a tightening Fed and slowly slowing China bode well for global economic growth. Sure, there is still a lot of debt driven QE loot floating around, but we’re getting close finally to a “recognition” of either inflation or that the economy just isn’t really all that good organically. Maybe both. We’ll see. I don’t think the “Big One” comes until 2020, which followers will get to read about. Subscribers are already getting hints as I plan a trip to Japan (hmmm, a hint maybe? Ask Kyle Bass). Ultimately, I see an earnings disappointment towards the end of 2018, maybe Q3. That will wipe out any rebound from the early year correction. By year-end, I see an S&P 500 with earnings at about 130 and trading at 2,500. Multiples won’t respond to that. So, I see a small loss for 2018 on the S&P 500. Ah, but remember, I also see the S&P 500 going to 3,000 by late 2019, so, get ready to be a buyer on the small correction that’s coming. Of course, I’m probably wrong and I know it. 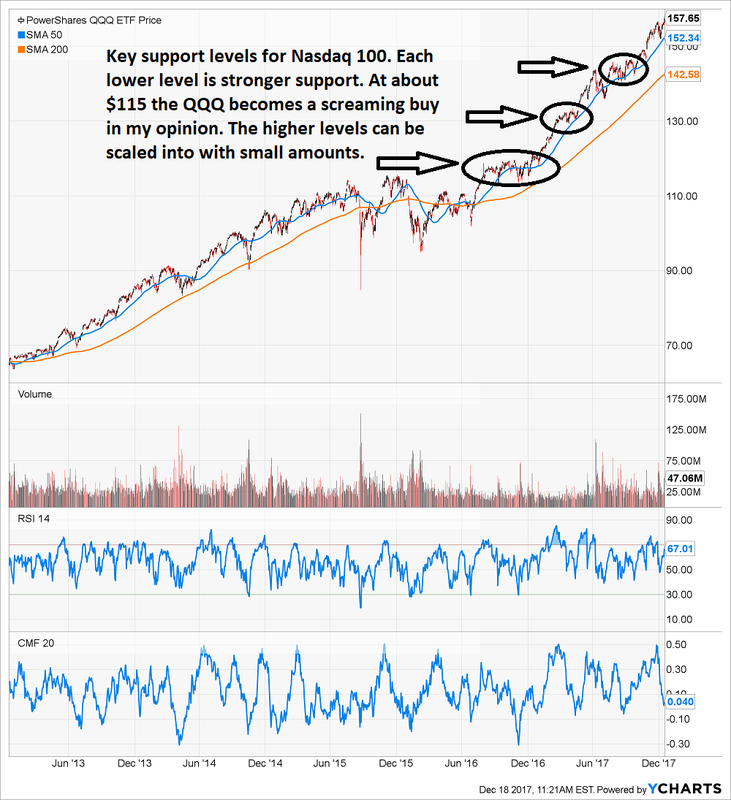 So, I’m keeping 25% in cash, writing a lot of cash-secured puts on companies I like from lower entries and have some limit orders placed for the PowerShares QQQ (QQQ) if support levels are reached. Ultimately, I like the stocks I buy, so I’m not worried about being heavy in cash. Smart tactical asset allocation is a good thing. I have been able to beat the market despite high cash levels in 2017. I’ll share that composite chart as soon as I have year-end numbers. What Else Do I Think? I think that GDP will disappoint and come in closer to 2% than 3%. So the over and under is 2.5%, and I’m taking the under. I think the PowerShares QQQ ETF (QQQ) beats the Vanguard S&P 500 ETF (VOO) and SPDR S&P 500 ETF (SPY) while breaking about even for the year. More people will realize that climate change is real and that burning coal and oil is really bad for the planet and us. I think the Packers go 15–1 next season finally get home field advantage in the playoffs and win the Superbowl (yeah, that’s early 2019, but so what). The Milwaukee Bucks are going to be a surprise team at the end of the 2017–18 season winning a playoff series and looking very good moving into next year with LeBron out in L.A. I might even win a World Series of Poker bracelet. 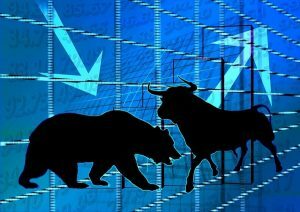 I’ll be safer than the markets as usual and probably still beat the index returns (again), especially if I’m right about an early year correction. HAPPY NEW YEAR!!! 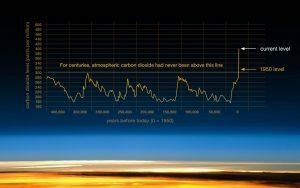 THE WORLD IS GETTING BETTER! BELIEVE IT! EVEN IF THERE ARE BUMPS IN THE ROAD.